At Peirce, we occasionally have multiple members of the same family graduating together. We’re always so excited when someone tells us that they went back to school with their sibling/father/grandmother because their stories of motivating each other are inspiring to hear. Luckily, the tradition is continuing and Commencement 2015 is a family affair for a mother and her two daughters. After graduating from South Philadelphia High School in 2004, Renee Martin tried to go back to school twice but wasn’t able to persist. In 2013, she looked to her future and realized that now was the time to get serious about earning her degree. As a consumer product advisor for Microsoft, she needed a bachelor’s degree to move into a management position, so she started doing her homework on schools in the Philadelphia region. A few months before Renee’s moment of realization, her mother, Ramona Watson, had done her own research on the best option for going back to school and found Peirce. Ramona has worked at the Philadelphia Water Department since she was 19 and, like her daughter, realized she needed to earn her degree to stand out from the crowd and advance further in her career. She enrolled at Peirce in January 2013 and encouraged Renee to do the same. Peirce offers all City of Philadelphia employees, their spouses and their children a 25% discount on tuition, allowing Ramona, Renee, and second daughter Brenda Eldridge to attend Peirce affordably. Brenda is the mother of two children, ages 1 and 6, and works two jobs. 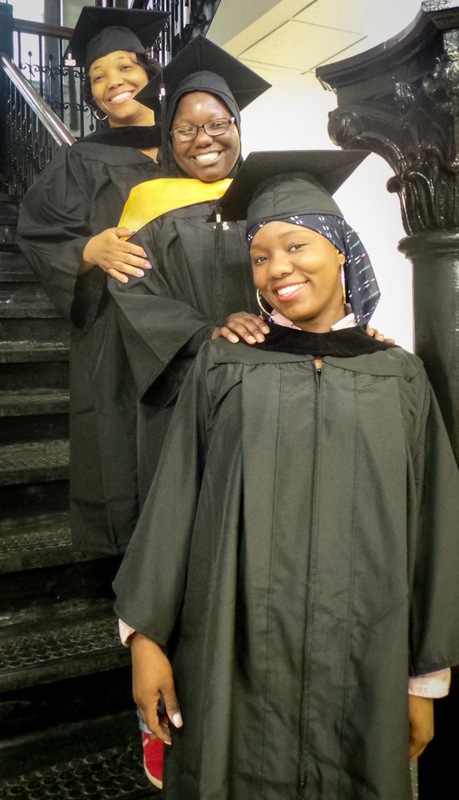 She never really considered getting her degree after graduating from South Philly High in 2006 but after having children, she knew she wanted to make a better life for them. After seeing her mom go back to school, she decided to join her sister and they both started classes in March 2013. Now, all three are graduating together! Renee and Ramona are graduating with associate degrees in business administration, concentration in management, and Brenda is graduating with an associate degree in criminal justice studies. Over the past two years, they've had several classes together and have been each other's biggest cheerleaders. In the beginning, Ramona was the motivator for her two daughters, often calling them to ask why they hadn't responded to the online discussion threads yet. Now that they have two years of classes under their belts, they all take turns being the encouraging one. In fact, in a recent course, Renee was the one calling her mother to ask why she hadn't responded to the discussion thread yet. All three women are dedicated to earning their degrees and have already started classes at Peirce toward their bachelor’s degrees. "We thought about taking a break [after earning their associates' degrees]," said Renee. "But we know we have to just keep going." We can’t wait to see all three of these determined women accept their diplomas next week. Thanks for sharing your stories with us, Renee, Ramona, and Brenda, and best of luck as you continue in your studies!